CircleMe has developed and refined a set of technologies which allow the company to lead globally in the efforts of gathering, interpreting, categorizing and distributing millions of content pieces to people who find them relevant. Today, CircleMe collects daily 500-1000 new articles (and other content) on any of 1 million interests available on the platform. Once assigned to the interests of the platform, these news are then brought to the attention of the users based on their interest-profile. 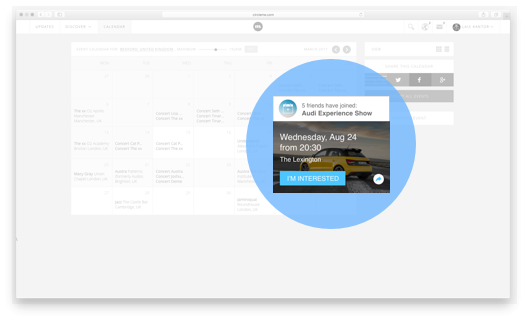 Furthermore, CircleMe can generate for each user a Personal Calendar which will populate only with the events that are relevant based on their interests and location. 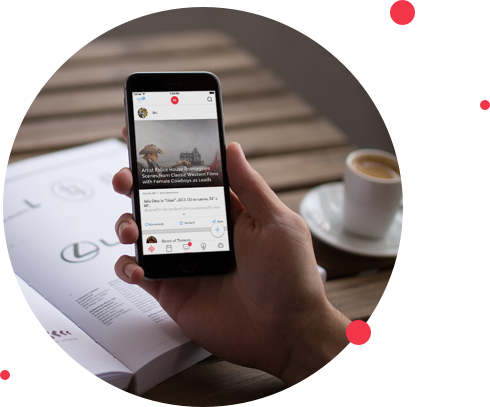 Today, globally, hundreds of thousands of active and engaged users leverage CircleMe to access content they are truly interested about. Do You want to collaborate with CircleMe? Explore the ways you can leverage our technologies and our community for your business needs. Do you need to engage with your community? Do you want to offer daily fresh content on any topic? Do you want to distribute different content to different users without the expensive burden of manual content curation? CircleMe’s technology is the solution you are looking for! 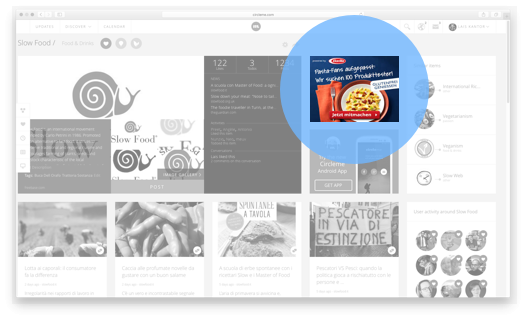 CircleMe can provide to partners the ability to collect, organize and distribute content in real-time and for significant volumes, on any topic imaginable. 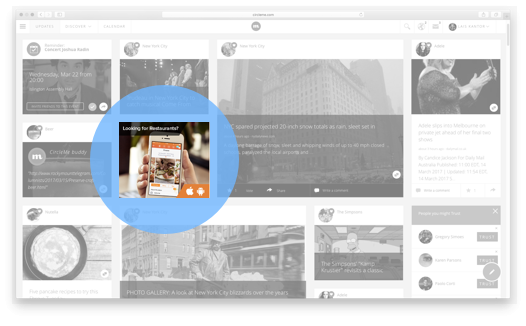 Receive an unlimited feed of content, perfectly aligning with your users’ interests. Get also additional information related to any interest (e.g., description, images, etc.) and correlation-analysis between interests across categories. Leverage our profiling technology to learn more about your customers & users, so to provide a better service on your applications. (Ideal for publishers and editors). Get a fully functional and optimized CircleMe application adapted for your specific community, branded for your business. Is your business seeking for real engagement online (and not the superficial one of the usual social networks)? Do you care to reach people who are truly interested about what you communicate? Reach out to our community, who cares to engage with content related to its interests. We work with companies to tailor a message that will be welcomed by our users. Distribute your engaging content directly to CircleMe users who have transparently expressed an interest for such a topic. Focus on real engagement. Through our Personal Calendar, reach out to people who’d care to hear about your event, due to their interest-profile and their location. People interested in the event will be able to share the event with others and receive reminders when desired. Be recognized as a sponsor of our community, and receive recognition and praise from users who appreciate our focus on a content-relevant experience. Our aim is to create a platform focused on the quality of all the content distributed, so to provide an unparalleled experience to all our loyal CircleMe users. If you believe our mission fits your needs, we would be grateful and excited to do business with you. For any of your needs, please contact us now.